This Sweet Potato Casserole is loaded with rich and cozy flavors of brown sugar, cinnamon, and nutmeg. 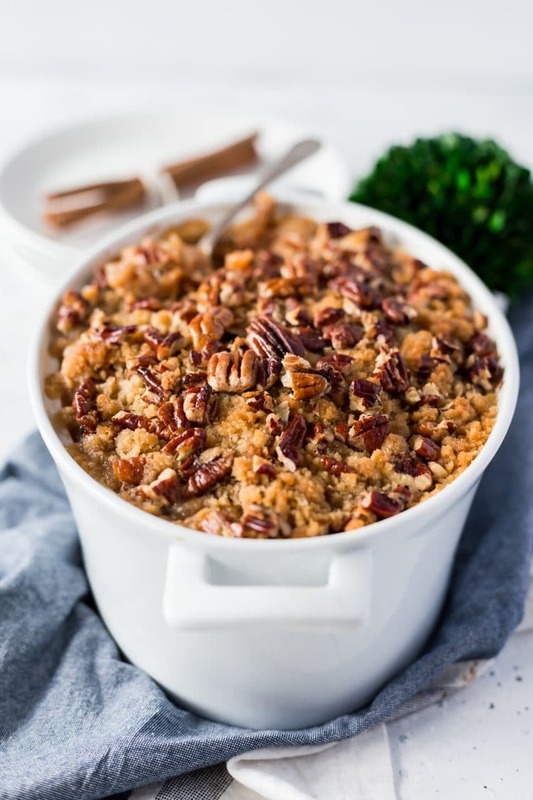 It’s laced with butter and crunchy pecans, the perfect holiday side dish! I’m pretty sure we can all agree that the best part of Thanksgiving is the side dishes. I mean, nothing quite beats mashed potatoes and gravy and tart cranberry sauce and fluffy dinner rolls, and the sweet potato casserole, oh man, the sweet potato casserole, now that’s my all-time favorite. I just can’t get enough of that delicious and creamy sweet potato mixed with brown sugar and spices. It’s so easy to make with canned sweet potatoes and if you’re willing to put in the extra effort to make it with freshly baked sweet potatoes, it’s still totally worth it. JUST TAKE ME TO THE SWEET POTATO CASSEROLE RECIPE ALREADY! 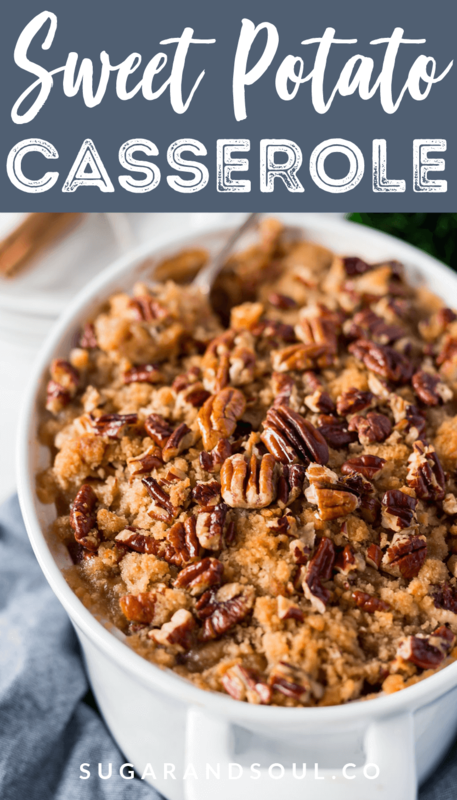 If you’d rather skip my (very helpful, I think) tips and tricks, essential cooking info, and similar recipe ideas – and get straight to this deliciously easy Best Ever SWEET POTATO CASSEROLE Recipe – simply scroll to the bottom of the page where you can find the printable recipe card. Over the years we’ve altered it a bit, sometimes adding marshmallows (mini work best), sometimes not. You can put the marshmallows on one side of the casserole if you have split tastes amongst family members like we do. We’ve also been known to drizzle maple syrup over the top as well for even more fall flavor. But even without both of those things, this holiday side dish is so tasty and comforting! 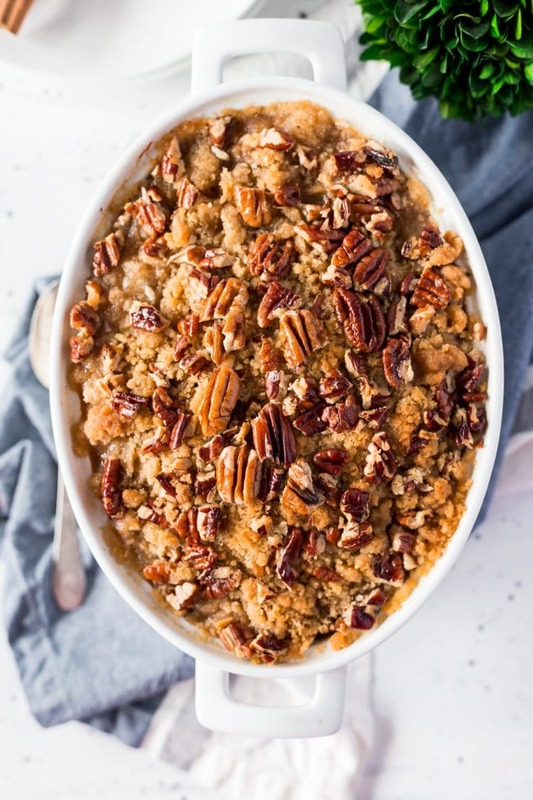 Can I Make This Sweet Potato Casserole Ahead of Time? Yes and no. So you can prep your casserole ahead of time, but really shouldn’t do it any earlier than two days before. Just don’t bake your casserole immediately. Cover it with plastic wrap and place it in the fridge, remove from the fridge 1 hour before baking to avoid cracking your casserole dish. You really shouldn’t. Because of the milk, butter, and eggs, freezing can have a huge impact on the final dish. Because of this, the freezing method for this type of casserole can be a bit tedious and complicated. 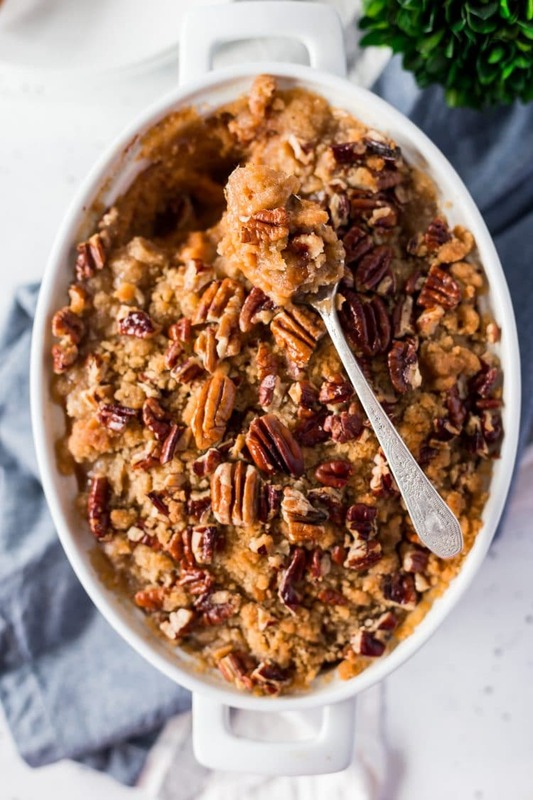 Is Sweet Potato Casserole A Side Or Dessert? Pin this Sweet Potato Casserole for Later! This Sweet Potato Casserole is loaded with rich and cozy flavors of brown sugar, cinnamon, and nutmeg. 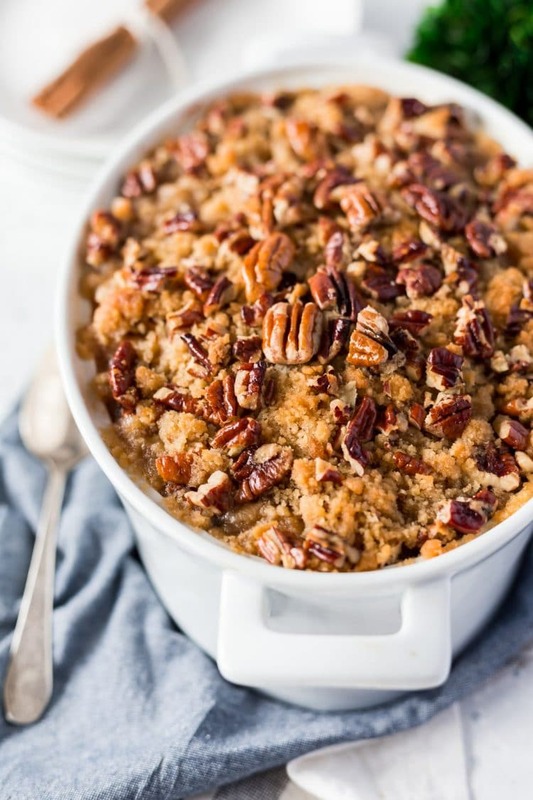 It's laced with butter and crunchy pecans, the perfect holiday side dish! Preheat oven to 350 degrees F. Grease a casserole dish with cooking spray and set aside. In a large bowl or stand mixer, mix the mashed potatoes, butter, eggs, milk, sugar, vanilla, cinnamon, nutmeg, and salt together until fully combined. Pour the mixture into the prepared baking dish. In a small bowl, mix together brown sugar and flour. Cut in the butter and mix in the pecans. Spread evenly over the sweet potato mixture and cover loosely with aluminum foil. Bake for 15 minutes. Remove aluminum foil and bake for another 10 to 15 minutes, or until top is until golden brown. If adding marshmallows, add to the top and place under a broiler for 3 to 4 minutes until tops are toasted. *You can use fresh sweet potatoes as well, substitute the canned for 4 ½ cups mashed sweet potato (5-6 baked sweet potatoes). *If using fresh sweet potatoes, you may want to add to a food processor before mixing with other ingredients. *If using fresh sweet potatoes, you may want to mix in 2 tablespoons of maple syrup (or even honey) to the potato mixture. The canned potatoes come in a syrup and this is to help balance the sweetness between the two cooking options. OMG, this looks so delicious. I’ll have to save this for the next holiday to make for my family. I know that they will like it. One of my favorite side dishes – at any time of year. And I’ve never thought about it being more like a dessert, but it totally is! 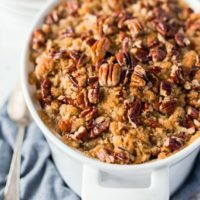 I love sweet potato baked with cinnamon but have never tried it like this, it looks absolutely delicious! You must next time you have a big feast! Mmm sweet potato casserole & stuffing are my favourite parts of Thanksgiving dinner!